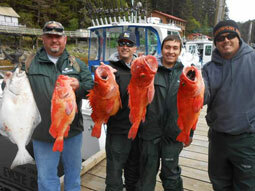 We will be the first to admit that Elfin Cove won’t show up on anyones top 10 places to fish for halibut. Which is just fine with us. 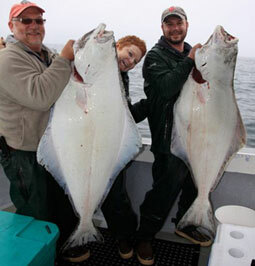 We would prefer to keep the incredible halibut fishing as our little secret. At least for now. The waters we fish are rich with baitfish and other aquatic sea life that allow our halibut to grow large. You will find calm waters most days and a lot of bent rods. We fish in waters that average 200ft and the tidal exchange is relatively calm. You won’t find us double anchored in a 20ft tidal exchange. Instead, our captains work hard to find the best and calmest waters which has helped us build a reputation for consistently putting our clients on big fish. 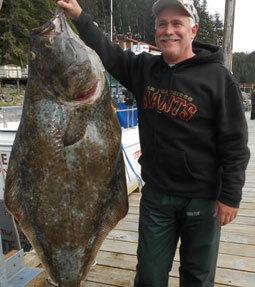 When we say it’s not uncommon to catch halibut the size of barn doors we are serious. 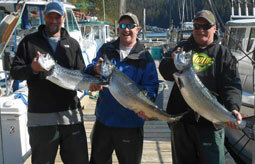 Our professional guides are season veterans in the waters of Cross Sound and Icy Strait. 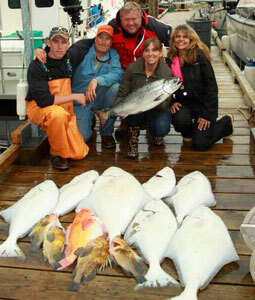 They know the halibut holes better than anyone, and that is backed up by consistently putting our clients on big fish. And lots of them too. If you are after a 100 pounder, no problem. A 200 pounder? That’s doable. So is a 300 pounder. A 400 pounder? Not so fast. How does 386 pounds sound? That’s our lodge record. Oh yeah, if you want to catch a bunch of 20-50 pounders (we call them chickens) we can do that too. The point is, we have the halibut fishing dialed in and there are not many places that can claim that. Calm waters. Incredible scenery. Countless salmon migrating through Cross Sound and Icy Strait. Limits. Smiles. It’s hard to conjure up a better place to fish for Pacific salmon. In fact, we challenge you to try it. We are pretty confident that you will not find a better place. As salmon migrate from places like the Bering Sea and the Gulf of Alaska they will pass through Icy Strait and Cross Sound where they will continue to feed on the abundant supply of baitfish. Our captains know the travel lanes the salmon take, and they know how to expertly fish these waters. Aboard our stable and comfortable boats you will troll or mooch for salmon depending on the conditions. Trolling with the use of downriggers is very common and quite effective. If the opportunity presents itself you can mooch where the bites are fast and furious. The vast majority of waters we fish are relatively calm. In other areas you can get some tide swings up to 24 feet, but here in Elfin Cove the average tidal range is 8.6 feet. This means you are much less likely to experience sea sickness. We pride ourselves in fishing calm waters. Our salmon season begins in May and lasts through September. 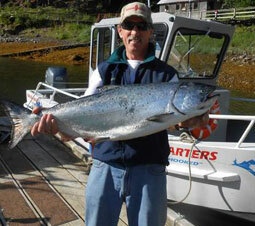 King salmon average 30 pounds and weigh upwards of 60 pounds (the lodge record is 62 pounds!). 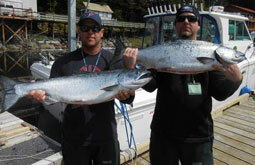 Coho salmon, also called silvers, average 10 pounds and can weigh up to 20 pounds. When they are running you can catch pink salmon until you grow tired of catching them. When all is said and done we are confident you will agree Elfin Cove offers the best salmon fishing throughout Alaska. There is something to be said for hooking a fish that is as big as your sofa. Enter the increasingly popular salmon shark, which has been know to stretch upwards of 8 feet long. .
Southeast Alaska’s salmon shark population is estimated at around 2 million and it continues to grow annually. The waters in and around Elfin Cove have some of the highest concentrations due to the high population of salmon. Salmon sharks can reach speeds up to 60mph. Imagine trying to land a fish that big with that much power. Let’s just say it takes big game fishing to another level, which is why more and more of our customers are requesting to fish for salmon sharks. Our crew has become proficient in fishing for them. They know their feeding habits, where they can be found throughout the year, and how to catch them. We use heavy duty tackle, fighting belts, and big baits to tame these beasts. 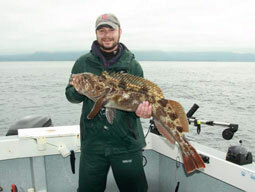 Speaking of big, you will be happy to know that the waters we fish are heavily populated with a variety of bottom/rockfish, including world class ling cod, monster yellow eye, sea bass, and a variety of other species. It is fairly common for our guests to catch a limit of salmon or halibut then spend a couple hours jigging for bottom fish. It is not uncommon to catch ling cod that are 3 or 4 feet long, a yellow eye that weighs over 10 pounds (lodge record is 22 pounds! ), and a limit of sea bass in a matter of hours. This makes an excellent way to end the day on the water. 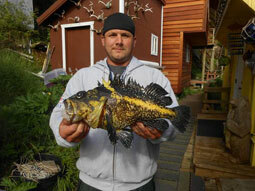 Also, these are some of the best eating fish in Alaska.